Monster Jam ® Triple Threat Series brings adrenaline-charged family entertainment to fans across the country. 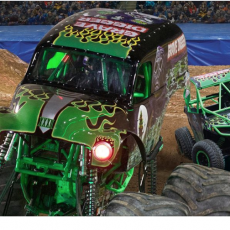 These world-class Monster Jam vehicles and athletes deliver what fans want to see most more trucks, more racing, more freestyle, more donuts, more wheelies, more action! Each event tests the versatility of the athletes as they go head-to-head in seven different competitions driving three different vehicles Monster Jam trucks, Monster Jam Speedsters and Monster Jam ATVs. These athletes battle for points in challenging Racing and Freestyle events that push themselves and their machines to the limit. The point leader will receive an automatic bid to the prestigious Monster Jam World Finals ® to compete for the title of World Champion.